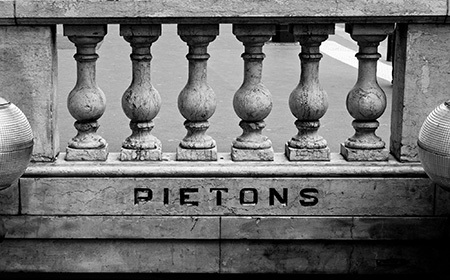 Black and white architectural detail of a pedestrian underpass sign Paris, France. Angels playing harps are a classic depiction, but why not tapping a beat with a tambourine? Anne-Marie Roux-Cola’s 1935 commission for the decor of the Saint Odile Church entrance fired her imagination. 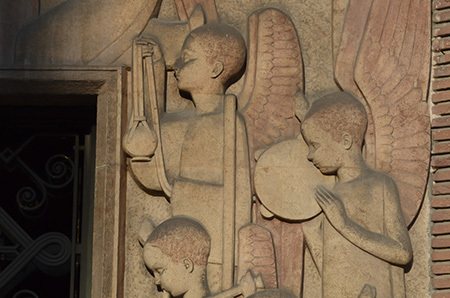 Using warm, ochre-toned sandstone from the saint’s native region of Alsace, she sculpted an orchestra of angels that include string, brass, and percussion musicians, such as this somber young tambourinist. His feathery wings sweep upward, in the Art Deco style inspired by Aztec and Egyptian art. The name Odile means "daughter of light;" she is the protector of those who are spiritually and physically blind.